There are few plants that can bring a touch of the Mediterranean to the garden as effectively as a palm tree and what's more, there are so many attractive species to choose from - including a decent selection of cold hardy varieties! The trouble is though, palm trees can be extremely cumbersome to transport and expensive buy, but there is an answer. Grow your own palm trees from seed! Yes it will take time, but you can grow as much stock as you like and the comparative costs are negligible. Before you begin, be aware that the best results will usually come from fresh seeds. Try only to germinate ripe seeds and avoid immature, green seeds. 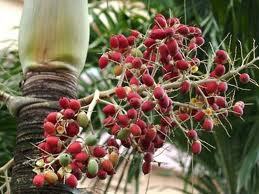 If you are collecting palm seeds yourself the ripe seeds will be within the mature, coloured fruit and ready to drop. Poor germination results are usually the result of either old or poor quality seeds. The most frequently used germination technique is the 'Polythene Bag' technique. Its popularity is down to its simplicity which means you may need to use more sophisticated methods of germination with more exotic seeds. To begin with, soaks the seeds for 24 hours in warm water. Then place the seeds with either some slightly damp moss or a formulated palm seedling compost mix into a transparent polythene bag. You may also wish to as a small handful of perlite to this mix to help aeration. Avoid overly damp compost as this can encourage fungal rots among the germinating seedlings. Seal the polythene bag and then place in a warm, bright environment at about 80 to 85 degrees Fahrenheit. Be aware that germination rates are going to vary wildly depending on the species of seed sown so you will need to keep a reasonably close eye on the seedlings after a few weeks. Once the seeds have germinated, un-zip the baggies. remember to keep the substrate damp but please make sure that it is not waterlogged. When the seedlings have grown about an inch or so they can be potted on and moved to a protective environment until they are ready to be transferred outside.